Business-friendly think tanks, corporations and their friends in government want consumer satisfaction to reward and punish professors and universities. They want market forces to replace public bodies in educational decision making. This book looks at disturbing new trends in post-secondary education — evaluating colleges and universities using simplistic financial measures and deciding on government funding to these institutions based on business-oriented measures of performance. Bruneau and Savage examine experiences in Canada, the U.S., Britain, Australia and New Zealand and suggest a return to true accountability. 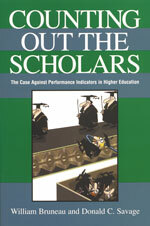 "Counting Out the Scholars" sells for $19.95. It is available in book stores, or can be ordered from the publisher by phoning 1-800-565-1975.